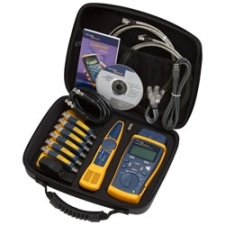 The CableIQ Advanced IT Kit is designed to maximize the efficiency of any cable qualification job. Use the IntelliTone 200 Probe to find cables quickly and definitively, even on active networks. Use the six smart cable IDs to perform a high volume of qualification tests in a short period of time. Each smart ID has the capability to perform a simple wiremap test or a full qualification test. Up to seven qualification tests can be performed without returning to the patch panel. The rugged carry case can be used to easily port tools from one job to another.